Thanks for your interest in an Up Your Game "traincation" in Boulder. We&apos;re thrilled to help you advance your sports performance while helping you enjoy the best of our city. Please fill out the info below, or contact us directly for more information. We look forward to reviewing your inquiry and will contact you by e-mail within two business days with next steps. 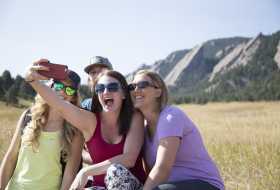 We are familiar with the services offered at CUSM&PC and lodging options, and we are eager to help you put together an amazing traincation in Boulder. Photo credit: Runner, Glen Delman; Flatirons runners, Glen Delman; cyclist, Jim Hueck.